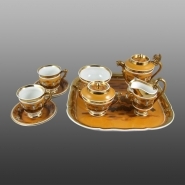 The complete dejeuner set includes a beaded French chocolate cup and stand which is shown on pages 129 and 130 of the Spode 1820 Shape Book. See below. Shown here is page 130 of the Spode 1820 Shape Book which includes four shapes for the dejeuner pieces with measurements. A beaded dejeuner shape teapot and cover in pattern number 2643, bat printed showing a band of cherubs besporting themselves on clouds. Overpainted with orange and brown enamels and having additional gilding. Print number P.311 from the Classical and Contemporary Humanity Series. Print reference Drakard, David and Holdway, Paul. Spode Transfer Printed Ware, 1784-1833. Woodbridge, Suffolk, Antique Collector's Club, Inc., 2002. This teapot is part of a dejeuner set as illustrated in the Spode 1820 Shape Book, page 130 and in the additional image.